It’s been a hectic three weeks. Spring break was last week, but with this extremely busy week, it feels like we never took a break. Before the break, I mentioned that my mentor was leaving for China for two weeks. During those two weeks, I wasn’t able to work on much. On the Friday before Grace left, I went to her house and borrowed her paints. If I were to actually work during the break, I would have to buy all the acrylic paints and would basically cost me hundreds of dollars. Using Grace’s paints was a great help to me; however, what I didn’t remember was that I should have borrowed some paint brushes as well. The paint brushes I had at home had very weak hairs on the brush. The hairs were very dry and would therefore split when I dragged it across the canvas. Grace has over sixty different brushes and each brush has very sleek hairs. When a paintbrush has sleek hairs, it is easy to blend and work at fine detailing. I didn’t think using my brushes would be a huge problem, but quickly I learned that it actually effects my painting a lot. My painting ended up looking extremely sketchy, and thin. I couldn’t go back to Grace’s house either because she was away. 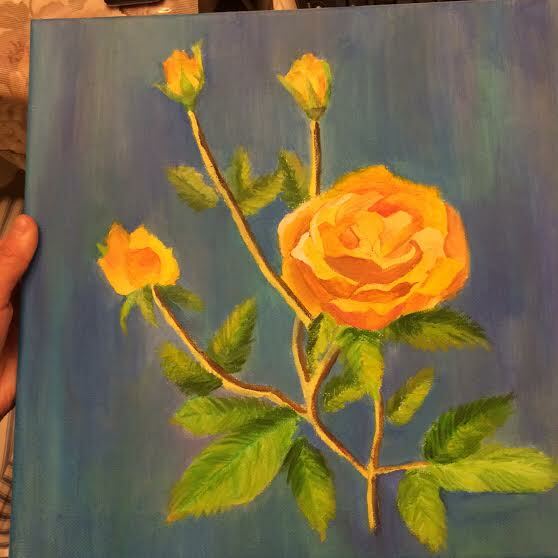 I ended up trying to paint, but basically re-painted it on Tuesday at my lesson at her house. Besides that problem, my painting has been going pretty quickly. I almost finished painting three of the pears during my two hour lesson. I’m expecting painting the leaves on the pears to take me several weeks because the details and lighting on the leaves are hard to paint. What I found interesting was that the harder the pear looked to paint, it would actually end up being easier to paint for me. I’m not quite sure why, but if a pear had lots of difficult lighting and bumps, I found it easier to paint than a smooth flat pear. 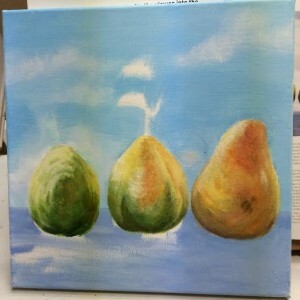 On my example on the bottom of this blog post, the pear on the very left was easiest to paint even though the pear on the right seems easiest. I actually had a lot of trouble with that pear particularly because my brushes at home weren’t able to smooth of the paint properly. Besides that, I feel like my progress has been pretty quick. In the background I also painted a small painting that I don’t think I’ll bring to In-depth night because it was really quick and not that great in my opinion. I might consider painting and fixing some of the details on the painting if I don’t have enough paintings for the actual night. As for De Bono, Grace and I have been talking a lot about time saving concepts during our recent sessions. She told me some ideas on how to possibly work faster if I want to finish more paintings by May. I was told that if I’m working with one colour, I should finish painting everything on the canvas in that colour. I could finish all three of the pears faster this way as they all have similar colour schemes. As for our alternatives, there hasn’t been many extreme changes during my process. I have decided to change some of my paintings because I noticed that the time frame was too short. We have also chosen alternatives for some of my painting techniques. We would sometimes change the colour schemes or patterns on a photo and change it on my painting to save time. A common theme in my alternatives was changing my painting in order for me to save time. Overall, I’m excited to finish my pear painting some time these next couple weeks, and to start another painting some time soon. I’m not sure what I should paint next, but I’m thinking of maybe painting orca whales. If anyone has any suggestions on what to paint, let me know in the comments. For now, check out my progress! You have a enough paintings to set up a miniature art gallery at in-depth night! You know I love orcas, especially when they are spy-hopping or breaching out of the water.